ATTENTION: OUR BOTS WILL NEVER ASK YOU FOR ITEMS! DO NOT ACCEPT THOSE TRADES! Login with your Steam account and click on My Account. Scroll down and set your Steam Trading URL. Where can i find it? 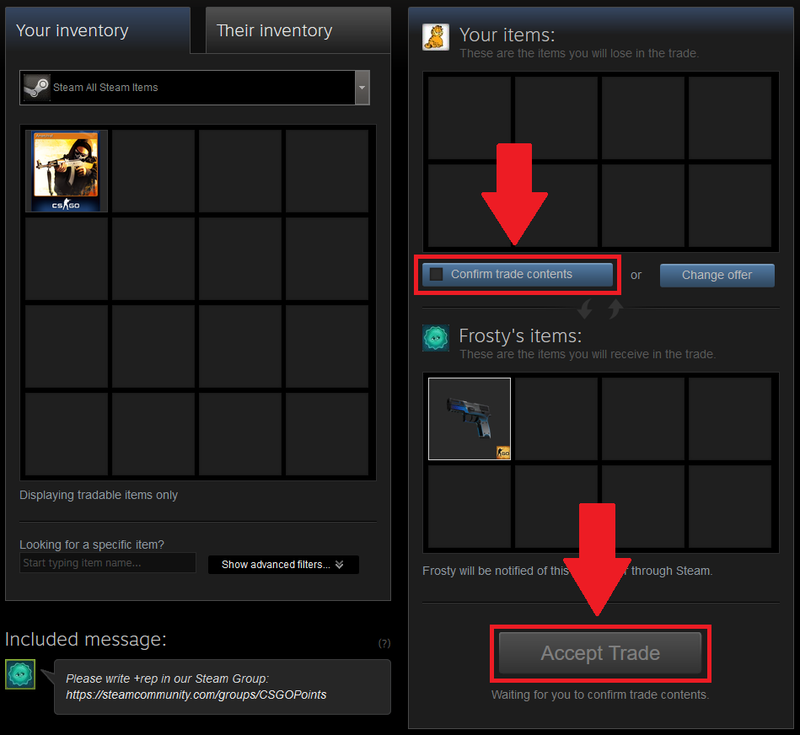 Click on the REDEEM NOW button, it will request the bot to send you a Steam Trade Offer. Click on the Open Trade Offer button, it will open the Steam Trade Offer in a new window. Confirm the trade like marked on the screenshot. 1) OUR BOTS WILL NEVER ASK YOU FOR ITEMS! DO NOT ACCEPT THOSE TRADES! 2) If you have the Steam error: "You have logged in from a new device. ", try to accept the trade directly over Steam installed on your PC. After you have received your CS GO Skin, please join our Steam Group and write a comment with +rep, which means "good reputation".